I have probably mentioned more than once that I am a messy cook and my kitchen often reflects my inability to cook neatly. My kitchen is never spotless like Giada's or Alton's. However, I have redemption. I just read that creative people tend to be more "messy" or "cluttered." Last night I went into the kitchen to scoop up some ice cream for the kids, as the night before we all test-tasted some gelato, but the container did not hold enough to satisfy all of us. I started pulling out toppings. Their favorite is chocolate magic shell. And then my mind started racing. I recalled reading one time that Magic Shell gets its "magic" from coconut oil. Oh what a coincidence I have some of that on hand. And corn syrup to thin it out...and while it would not be my preferred type of Ghirardelli chocolate, I had their milk and semi-sweet chocolate chips on hand. And we know a good cook never lets the lack of the "preferred" ingredient on hand, keep them out of their culinary studio! It's all about innovation. Now since it is October, Italian-American Heritage Month, my mind keeps recreating everything to be Italianofied. Is that even a word? No matter, it is now! So what better way to eat magic shell than to make it from Italian-American chocolate. Have you ever tasted Ghirardelli's chocolate? Oh my goodness, it is so delizioso. It is my go to chocolate for creating desserts. Combine all ingredients either in the top of a double boiler or in a bowl (if you are going to microwave it). You can also put a glass bowl over a pan of water that was brought to a simmer and then turn off the heat. Stir and melt the mixture over the hot water or heat in the microwave on 50% power at 15 second intervals, stirring thoroughly between each 15 seconds. Once it is melted let it cool to room temp before putting on top of ice cream. I placed mine in a mason type jar. 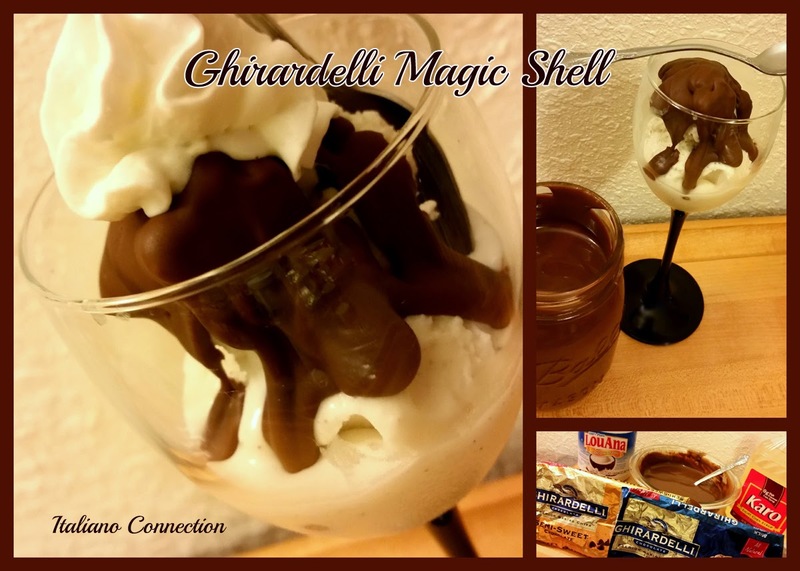 If your Ghirardelli magic shell is too hard on top of the ice cream you can thin it with a little more corn syrup.